Mahometis Abdallæ filii theologia dialogo explicata. Tr. from the Arabic by Robert of Ketton (fl. 1141-1157) et al., ed. Johann Albrecht von Widmanstetter (ca. 1506-1557). Nuremberg, 1543: beginning of the Quran text (unpaginated). The Latin translation by Robert of Ketton (fl. 1141-1157) was the only Quran version available in a European language until the middle of the seventeenth century despite the various contacts between Muslims and Christians in Europe, North Africa, and the Levant. The Cluniac abbot Peter the Venerable (ca. 1092-1156) had commissioned Robert and his collaborators to translate theological literature, including the Quran, to provide him with the sources for a refutation of Islam. These texts became known as the Toledan Collection. The Toledan Collection circulated widely in manuscripts, and in 1543 Robert's Quran translation was published in two independently prepared printed versions. The edition by the Catholic diplomat and orientalist Johann Albrecht von Widmanstetter (ca. 1506-1557) was overshadowed by the simultaneously published and much more successful Protestant edition, which will be discussed below. After a Humanist education at German and Italian universities, Widmanstetter focused on the study of Syriac, and today he is mostly remembered as the founding father of Syriac studies in the West. Syriac is closely related to Aramaic, an important language in Palestine during the time of Christ, and in late Antiquity Syriac became the liturgical language of many Christian Arab communities in Asia Minor and the Near East. But despite his familiarity with Semitic languages and Humanist philology, Widmanstetter relied on Robert's well-regarded Quran translation to participate in the theological disputes of the Reformation era through a discussion of Islam’s revelation. In Widmanstetter's version the Quran’s division into suras and verses is not recognizable because Robert's translation is a summary, and not a literal translation. The resulting difficulties of matching Robert’s Latin epitome with the Arabic original led William Bedwell (ca. 1561-1632), the English pioneer of Arabic studies, to compile an Index assuratarum Muhammedici Alkorani which was published as the second appendix to his Mohammedis imposturæ (London: Richard Field, 1615). Ed. and tr. into Latin by Ludovico (Luigi) Marracci (1612-1700). 2 vols., Padua, 1698, 2: 1. The Italian peninsula was the logical location for the first printing of an Arabic Quran in Christian Europe. The Italian city states had dominated trade with the Levant and North Africa since the Middle Ages, while the Catholic Church, despite dogmatic disagreements, maintained close ties with the Nestorian and Monophysite churches in the Near East. Arab Christians had attended Italian universities since the late Middle Ages. At the beginning of the sixteenth century, Italian presses were the first to print books with Arabic movable type, and a complete Arabic Quran was published in Venice between 1537 and 1538. The steady rise of book production in early modern Europe was accompanied by increased efforts of the secular and religious authorities to control printing and book trade, so that the publication of an Arabic Quran remained problematic. Seventeenth-century Europe was mired in religious wars, and the Ottoman and Safavid empires were feared Muslim opponents. The Italian priest and orientalist Ludovico Marracci (1612-1700) worked for decades on his Quran edition, whose publication was eagerly awaited by fellow Arabists. 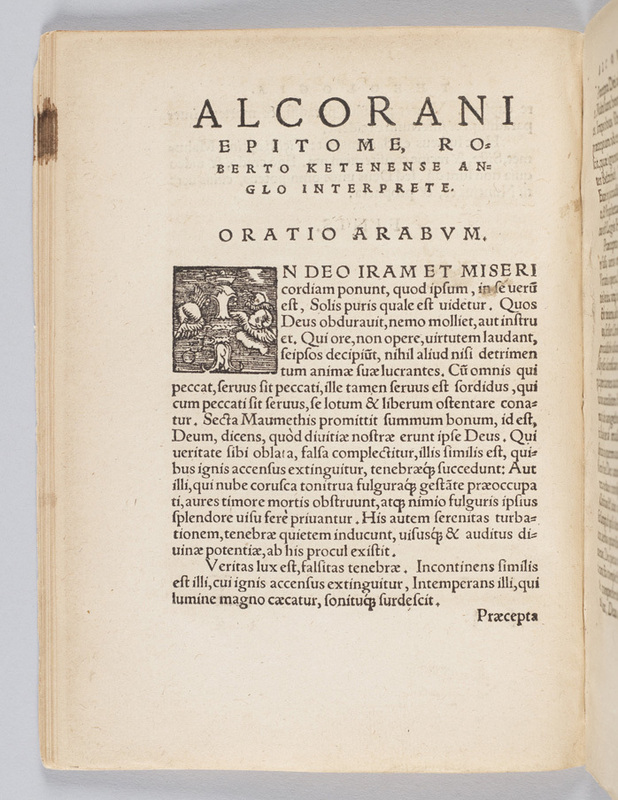 When the Arabic text, together with a Latin translation and commentary, was finally printed toward the end of Marracci's life, the text of the Quran was preceded by his Prodomus ad refutationem Alcorani, and Marracci dedicated his work to the memory of Innocent XI (1611-1689, elected pope in 1676). This pope had financially aided Poland and Austria in the military campaign that ended the Ottoman siege of Vienna in 1683. In his presentation of the Arabic text, Marracci adhered to Islamic conventions because all elements of a sura heading (that is, name of the sura, place of revelation, and number of verses) and the Quran's division into 30 parts are provided. But at the same time Marracci continued to follow biblical conventions since he numbered both the suras and their verses. Marracci’s Arabic text was published as a beautiful two-volume folio, and in Christian Europe it remained together with the slightly earlier edition of the Al-Coranus (Hamburg: Schultze-Schiller, 1694) by the Protestant theologian Abraham Hinckelmann (1652-1695) the authoritative version until the 1830s when Gustav Flügel (1802-1870) prepared a textus receptus. But in seventeenth- and eighteenth-century Europe there was also a considerable demand for more affordable, yet scholarly Quran editions. The Protestant theologian David Nerreter (1649-1726) included a German version of Marracci's Latin translation into his Neu eröffnete Mahometanische Moschea (Nuremberg: Endters, 1703), which was published as a small octavo. The Protestant theologian Christian Reineccius (1668-1752) prepared a revised edition of Marracci's Latin translation which was published under the title Mohammedis filii Abdaliæ pseudo-prophetæ fides islamitica (Leipzig: Lankisch, 1721). Machumetis Saracenorum principis eiusque successorum vitæ, ac doctrina, ipseque Alcoran. Tr. from the Arabic by Robert of Ketton (fl. 1141-1157) et al., ed. Theodor Bibliander (ca. 1504-1564). 2d ed., 3 parts in 1 vol., Basle, 1550, 1: 8. The entire Toledan Collection, as commissioned by Peter the Venerable, was prepared for print by the Protestant scholar Theodor Bibliander (ca. 1504-1564). The first edition of 1543, of which at least six different versions are known, was reissued in a revised version in 1550, and remained a major reference work of Islamic theology until the seventeenth century. During the Reformation European intellectuals began to see Islam, which is a monotheistic religion that had emerged after Judaism and Christianity, as a non-European example of a Christian heresy which allowed for a theological examination of Christian orthodoxy independent of the conflict between the Catholic Church and the newly established Protestant factions. The importance of Islam in the Reformation era discourse is indicated by the scholars and printers involved with the publication of Robert's Quran translation in 1543. In Nuremberg, the press that published Widmanstetter's Quran version issued in the same year De revolutionibus orbium coelestium by Nicolaus Copernicus (1473-1543). 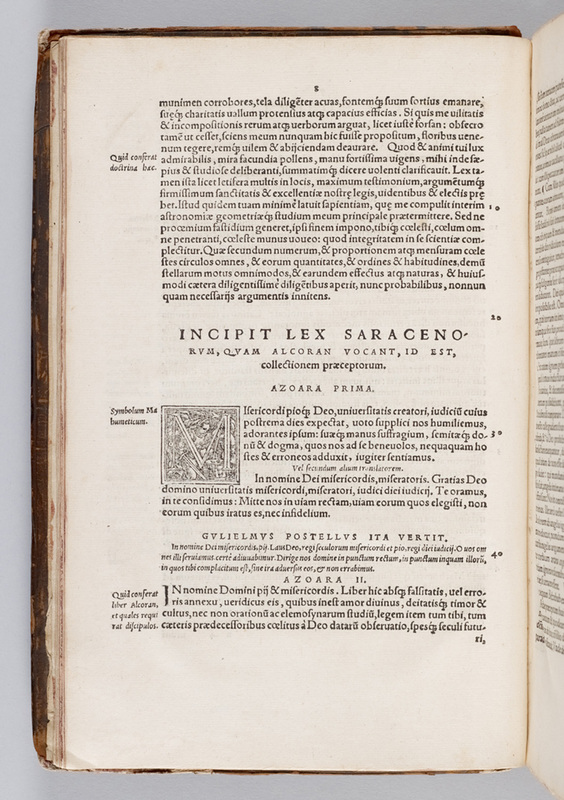 In Basle, Philip Melanchthon (1497-1560) contributed a "Præmonitio ad lectorem" to Bibliander's version of the Toledan Collection, and the book was printed by the press that the very same year also published the first edition of De humani corporis fabrica by Andreas Vesalius (1514-1564). Bibliander's version of the Quran is significantly different from the edition prepared by Widmanstetter, which has been discussed earlier. The text of sura 1 ("Azoara prima") is provided in three different versions: the first by Robert of Ketton, a much superior rendition by an unidentified translator, and the translation proposed by the Catholic priest Guillaume Postel (1510-1581). Bibliander had studied with Postel, the first instructor of Arabic at the Collège Royal in Paris. Bibliander’s grounding in comparative Bible studies is documented in this presentation of the translation variants. But the Quran is introduced as the Arabs’ law book ("lex Saracenorum") in which human laws were passed on as God’s revelation. The illustrated initial M shows a soldier with armor and weapons, associating Islam with warfare and recalling the contemporary advances of the Ottoman armies in south-eastern Europe. Historia Josephi patriarchæ, ex Alcorano, arabicè. Ed. and tr. into Latin by Thomas Erpenius (1584-1624). Leiden, 1617: final pages of the grammatical section (unpaginated). 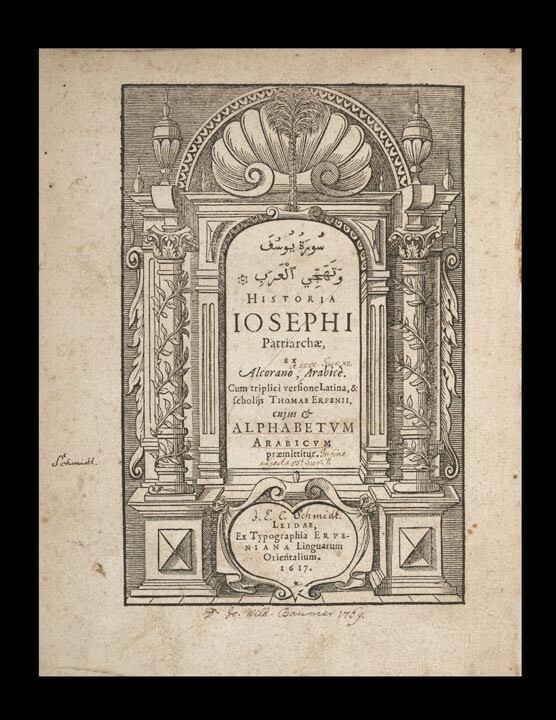 Thomas Erpenius (1584-1624) was the first outstanding European Arabist, and as Arabic Studies professor at Leiden University he published a number of Arabic texts with Latin translation to address the dire need for Arabic teaching materials. His decision to use sura 12, which tells the Islamic version of the story of Joseph and Potiphar's wife, for an introductory Arabic textbook was a pragmatic choice since his students already knew the Christian version from Genesis 37-50. Reading the Quran through the lens of Biblical studies reflected not only the traditional perception of Islam as a Christian heresy, but this approach also followed from the lack of available Arabic sources for the study of Islam and the Quran. Erpenius begins his edition of the sūrat Yūsuf with an introduction to the Arabic alphabet, as is explicitly mentioned on the title page. The book's second part is the Arabic text of sura 12 accompanied by Erpenius’s new Latin translation and Bibliander's version of Robert’s Latin translation. Erpenius discussed Robert’s translation in the third section, and provided an analysis of the Arabic text’s grammatical features in the final section. Like other books printed with Arabic type in early seventeenth-century Europe (for example, André du Ryer, Rudimenta grammatices linguæ Turcicæ, Paris: Vitray, 1630), Erpenius's student edition of sura 12 opens from the right - like a manuscript in Arabic script. The concluding grammar section ends accordingly with a FINIS on the bottom of the left page. Tr. from the Arabic by André du Ryer (ca. 1580-ca. 1660), tr. from the French by Alexander Ross (1591-1654). The French translator, diplomat, and orientalist André du Ryer (ca. 1580-ca. 1660) was the first to translate the complete Arabic Quran directly into a European vernacular. The almost immediately published English adaptation of du Ryer's French version (L'Alcoran de Mahomet, Paris: Sommaville, 1647), became an instant bestseller among English-reading audiences. In North America this seventeenth-century English Quran version circulated until the nineteenth century, and it became the first English Quran to be published in the U.S. (Springfield, Mass. : Henry Brewer for Isaiah Thomas, jun., 1806), even though the much superior English Quran translation by George Sale (ca. 1696-1736), which will be discussed below, had been available on the British Isles since the 1730s. Today, Burke Library owns three copies of the English adaptation, all issued in 1649, the same year when Elzevier and others published reprints of du Ryer's French translation in Amsterdam. The beginning of the Quran text shows that the suras, though not their verses, are numbered ("Chap. 1"). But this numbering of the suras is particular to the English adaptation. Du Ryer approached each sura as a coherent piece of literature, and thus eliminated interrupting elements, such as numbers. Ross preserved du Ryer's marginal notes which were written for learned readers who were familiar, for example, with the Arabic grammar of the Dutch Arabist Thomas Erpenius. There is, however, no evidence that du Ryer consulted Erpenius’s translation of the sūrat Yūsuf, mentioned above. The sura heading suggests that du Ryer was treading carefully with regard to the Quran’s status as a heretical text. According to the Islamic tradition the Arabic adjectives "Makkiyya" and "Madīniyya" signify whether God revealed a sura in Mecca or Medina, and yet du Ryer, as well as his English translator, rendered those as "written in Mecca" or "written in Medina," implying human authorship and implicitly rejecting the text as a divine revelation. 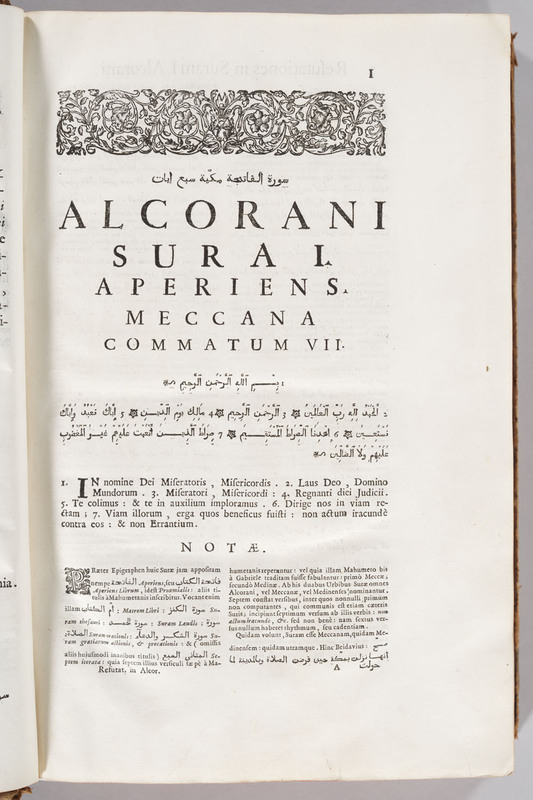 The title page, which is featured below in the bibliographical section of English Quran translations, indicates that, from the seventeenth-century perspective of absolutist Europe, Islam was the state religion of the Ottoman Empire and its Muslim subjects were Turkish: "The Alcoran … for the satisfaction of all that desire to look into the Turkish Vanities." Consequently, Muhammad is perceived as a Turkish prophet who had penned in Arabic a revelation: "Mahomet, the prophet of Turks, and author of the Alcoran." A state’s religious authority appeared as more important than differences in language and ethnicity. The Koran, Commonly Called the Alcoran of Mohammad. Tr. from the Arabic by George Sale (ca. 1696-1736). 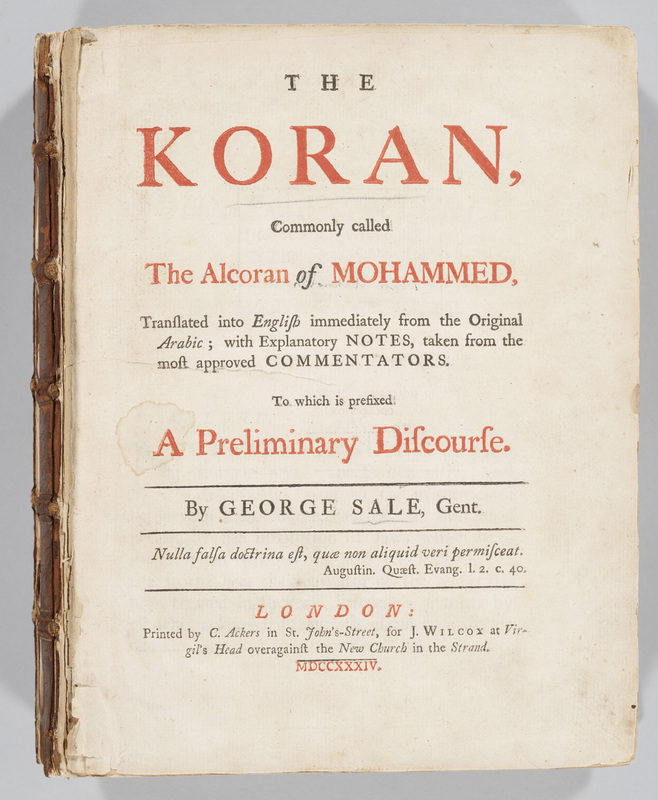 The first complete translation of the Quran directly from the Arabic into English was prepared by the solicitor and orientalist George Sale (ca. 1696-1736), and became an enduring bestseller with English-reading audiences. His translation has remained in print until the twentieth century, and in modern English Quran commentaries, it is listed among the sources. 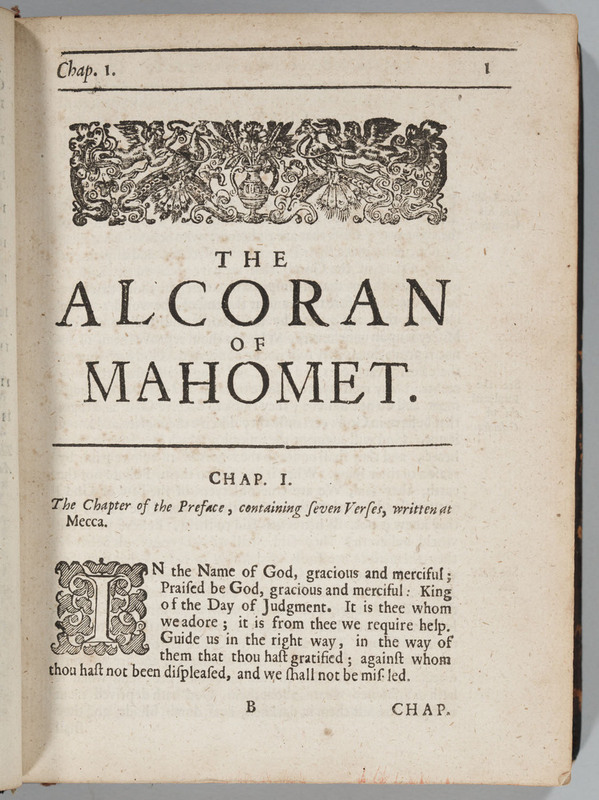 The title page of the first edition, which was published as a large quarto, documents how Sale and his publisher presented Islam's revelation to their audiences. The subtitle "Conmonly called the Alcoran of Mohammed" recalls the English adaptation of du Ryer's translation whose shortcomings Sale discussed in his address To the Reader. The authority of his new translation is highlighted with the assurance that its notes are "taken from the most approved COMMENTATORS," which comprises Christian theologians such as the already discussed Marracci and Muslim authorities such as al-Bayḍāwī (d. 1316? ), the author of one of the most popular Quran commentaries in the Near East and South Asia. The quote by Augustine (354-430) places Sale's translation in the tradition of Christian inquiry into heresy ("falsa doctrina"), yet also demands a self-critical approach to heresy that always contains a kernel of truth ("aliquid veri"). In his dedication to the influential English politician John Carteret, second Earl Granville (1690-1763), Sale argued that Muḥammad, though an impostor, deserved respect as a successful lawgiver who established the rule of Islamic law on the Arabian Peninsula. Thomas Jefferson (1743-1826) preferred smaller and less costly octavo editions for his private library. Jefferson, who had practiced law and collected, among other things, legal literature, owned a copy of the 1764 edition of Sale's Quran translation which in January 2007 was used for the swearing-in of Keith Ellison, the first Muslim elected to the U.S. Congress. 2nd ed., Leipzig, 1841: beginning of the Quran text (unpaginated). In 1834, the Leipzig printer Tauchnitz published the first edition of an Arabic Quran prepared by the German orientalist Gustav Flügel (1802-1870). In the West, this quarto edition replaced the seventeenth-century editions by Hinkelmann and Marracci, mentioned above. Until the 1342/1924 publication of the Cairo edition, whose text had been prepared by a group of Muslim scholars, Flügel's editon was considered an authoritative Arabic version of the Quran. Flügel followed the most advanced editing theory of his time, while taking advantage of the considerable riches of Arabic manuscripts that in the 1830s were available in the libraries of Vienna, Paris, Leiden, and Gotha. He chose a main source (Leithandschrift) and selected a number of Quran manuscripts and commentaries to produce a textus receptus that indicated neither variants between the manuscripts nor his emendations. In other words, this edition is fundamentally different from Marracci’s Quran edition - as well as Walton’s Polyglot Bible, which will be discussed below - because Flügel did not want to document the historical process of how the Arabic text of the Quran was established and transmitted. Moreover, he disregarded Islamic conventions for the sake of western Quran scholarship, since suras and verses are numbered. 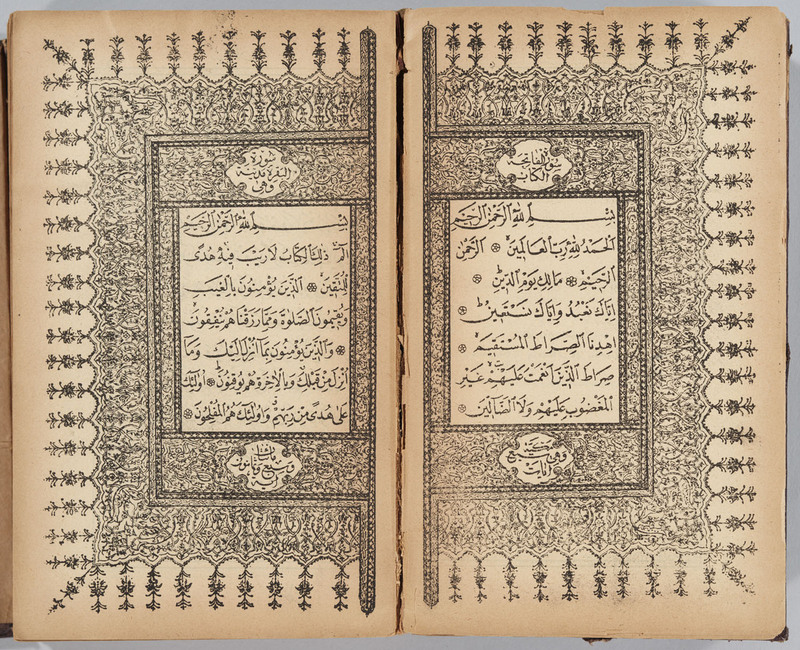 The first edition of Flügel's Quran was an instant success. It seems that Tauchnitz already prepared parts of this first edition for audiences in the Near East and South Asia, as among the different issues of the first edition there are many copies without European numerals and without the Latin title pages, dedication, and introduction. But in order to offer an octavo edition that would be in more complete agreement with the Arabic tradition, Tauchnitz asked the theologian and Hebraist Gustav Moritz Redslob (1804-1882) to create a version without numbered verses, which was first published in 1837. From 1841 onwards, Tauchnitz printed the repeatedly corrected texts of both the octavo and quarto edition with stereotypes, a recently refined technology that allowed for the cost-effective production of much more copies than traditional typesetting. 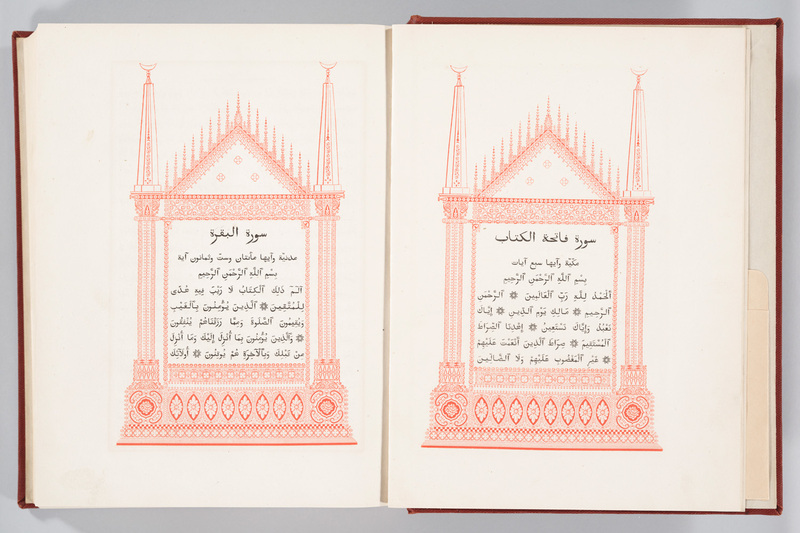 The illuminated opening pages of the corrected quarto edition of 1841 illustrate Tauchnitz’s intention of creating a printed book that preserves some visual features of a traditional Quran manuscript: the text of sura 1 stands on the right and the beginning of sura 2 on the left page. Only on the illuminated pages at the beginning, suras and verses are not numbered. No place, no date: beginning of the Quran text (unpaginated). It was only in the nineteenth century that Islamic book production in the Near East and South Asia moved from manuscript workshops into printing houses. The Muslim adaptation of letterpress printing and lithography to commercial book production is considered an important factor for the emergence of modern Middle Eastern nation states in the twentieth century. Specialists of the history of printing in Arabic script in the Middle East and South Asia tend to focus on how printing changed the intellectual and political discourse in Islamic societies through facilitating the access to books in general and the emergence of newspapers and magazines in particular. Consequently little is known about how the manuscript-to-print transition impacted Quran production, even though the demand for copies of the Quran, like that for copies of the Torah and the Bible, was never limited to the religious sphere. It is, for example, not clear how the etiquette for handling Qurans, which considerably varies between Muslim societies in Africa, the Middle East, Central Asia, and South Asia, influenced the production and distribution of printed Qurans. Very few Qurans that were lithographed in the Near East or South Asia, are nowadays preserved in collections in Europe and North America. Many nineteenth-century presses used contemporary machine-made wove paper so that their books were easily damaged by wear and tear and therefore cheaper to replace than to preserve. Moreover, Western collectors were much more likely to buy old manuscripts than new printed books. Since manuscript production continued until the beginning of the twentieth century, in many places printed books and manuscripts were traded side by side until the second half of the twentieth century. This lithographed Quran does not have a printed colophon or a printed title page. But the book still has its original blind-tooled binding, and the binding's decoration suggests that this Quran was lithographed in late-nineteenth century Iran. Unfortunately, the illuminated opening pages do not provide any reliable stylistic clues. Quran production tends to be conservative because, as in other religious traditions, the holy book's visual appearance is to some degree an integral aspect of its overall meaning. A more precise identification of the regional style that provided the model for this lithograph is further hampered by the intense cultural exchange between Iran and India in the sixteenth to eighteenth centuries. Craftsmen went to and fro, and most books are portable objects that circulate widely because of trade, gift-giving, theft, or looting.